Fallout 3 doesn’t follow the same basic formula for open-world sandbox games that has produced some truly great games, from Grand Theft Auto V to The Witcher 3. But what if Bethesda wasn’t making an open-world sandbox RPG at all? When Grand Theft Auto III released in 2001, it was a revelation. Sure, open-world games had existed prior, including Rockstar’s own Body Harvest, back when Rockstar was still known as DMA Design. But it was GTA3 that changed the landscape of gaming forever. In a post-GTA world, it seemed like everyone was scrambling to make open-world games. By the seventh generation, it seemed like every major publisher had a game influenced by Grand Theft Auto. Open-world games work something like this: the player exists in a large, 3D world, tackling it from a third-person perspective. Players travel between various points to complete or engage in missions. Many of the games feature cars, and those that don’t often include other means of quick traversal, like parkour or grappling hooks. The world map is peppered with icons for additional activities not relevant to the main story, many of which are repeated throughout the world, most often in the form of various challenges and minigames. Most of the people you encounter in the game world don’t have lives of their own—they disappear as soon as you get far enough away from them. From The Witcher 3 to Sunset Overdrive to Shadow of Mordor to Far Cry 4, open-world games almost all work the exact same way. At a glance, Bethesda’s games might appear to have a lot in common traditional sandbox games, with their big, open worlds, plethora of map markers, and long travel times, but playing through games like Fallout 3 is a completely different experience than the traditional sandbox experience. Last time we talked about Fallout 3, we looked at three basic things that made it awesome: it uses boredom to propel you out into the Wasteland, then it sends you on missions all around the map, not to pad out its content, but to distract you, leading you into its great world, where it occupies your attention by constantly asking you to think about the world you’re exploring. Combine those ideas with Fallout 3’s approach to the world and its inhabitants, and the game’s entire design starts to make sense. It’s breaking the rules, but it’s got a reason for that. All games can be arranged on a single spectrum. On one end, you have abstraction, and on the other, you have simulation. Abstraction is the idea that you can take something and distill into a simple, easily-understood form. Chess is an abstract game: rather than presenting a real battle, it presents the idea of one. Simulation, on the other hand, is a replication of reality. Total War games offer a greater level of simulation than chess by creating individual units, simulating how they might do damage based on their position in the world, and so on. Abstractions are often things like taking turns, button combos, regenerating health, and so on. It treats video games as games. Simulation elements tend to focus on things that make the game world a real space, like physics or advanced artificial intelligence. It treats video games as virtual realities. Most open world games offer abstract scenarios, bite-sized chunks of gameplay set in a larger overworld. Once you know how to defuse a bomb in Arkham Knight, you can simply repeat what you’ve learned in any bomb-defusing encounter the game presents. Open-world developers take a single action and make a repeatable mini-game out of it. At first, it might look like any other open-world game. You’ve got a map, you’ve got markers on the map. No big difference, right? The difference from traditional open-world is that these are all distinct locations, rather than discrete events. You won’t happen upon a location in the Wasteland only to have someone warn you that leaving the area will cause an event to cease, for instance. You won’t be able to predict what you’re going to do at any given location simply by looking at its map marker. You might get the general gist, knowing that a vault means underground exploration, for instance, but Vault 108, home to Gary, is very different than Vault 106, the vault of hallucinations. I’ve come across rooms in Fallout 3 where, long before, drug-addled psychos had attempted to climb the walls with plungers, falling to their deaths. I found a bizarre grocery store that had been converted into a Rube Goldberg machine. I once stumbled across a cave by accident; inside, I found a large recreational facility for raiders, which included prison cells stuffed with children’s toys and female mannequins with big, red light bulbs replacing their breasts. I’ve stumbled across completely abandoned villages and piles of corpses. As I was writing this, I watched a pack of Super Mutants shoot down a Vertibird. They’re locations, not minigames. Each place has its own sense of history. What this means is that, when you see something pop up on your compass, you have no idea what you’re going to get into when you get there. You are an inhabitant of Fallout 3’s world, which means that every location is new, fresh, and interesting. No two areas play out the exact same way, even if they have the same elements. Nothing is predictable. But what about Fallout 3’s other inhabitants? If you’ve played a game like Grand Theft Auto V, you know just how crazy car crashes can get. Of course, you also know that it doesn’t really matter, because none of the people involved are ‘actually’ people. You can’t follow them to their homes or jobs, and even if you could, most of the buildings in GTA aren’t actually buildings for these people to inhabit. They’re boxes dressed to look like buildings. Most open-world video games present a breathtaking virtual tableau, but that’s all it is. Visually, Fallout 3’s world seems simplistic itself, but what it lacks in detailed graphics, it more than makes up for in its world. The people of Fallout 3 live their own lives. One character, for instance, wakes up every morning, eats breakfast for an hour, goes to work, then returns home to sleep. Hundreds of other characters in the world act just as he does, living, breathing, eating, sleeping, and even dying, all entirely independent of you. Some characters ‘spawn’ in a more traditional sense, but a massive number of characters are simply people going about their lives in the Capital Wasteland. As if that weren’t enough, Bethesda takes this a step further, simulating not just bodies, but body parts. One thing that sets Fallout 3 apart from every other first-person game in the world is the VATS system, a real-time adaptation of turn-based gameplay. Fallout 3 allows you to target individual enemy body parts: shoot one enemy in the leg, and he’ll begin limping. Shoot another in her arm, and she’ll drop her gun. You can even shoot the gun! If it breaks, your opponent will have to switch to something else. Even better, enemies might loot a fallen friend, using their potentially better weapons against you. Ever seen anything like that in Assassin’s Creed? Fallout 3 enemies have varying levels of courage as well. If you hurt some enemies enough, you’ll frighten them and they’ll flee. Some characters take lengthy journeys through the world; you can follow James, the player character’s father, through the world in real-time after rescuing him from Vault 112. Merchants that roam the wastelands often have set paths between settlements where they can run afoul of super mutants, raiders, or wildlife. Even when life isn’t completely simulated, it still gives the impression of a real world. Certain areas in New Vegas, Obsidian’s follow-up to Bethesda’s Fallout 3, spawn the same monsters in the same locations every single time. It feels more like a traditional game: you know exactly which zones will have you fighting exactly the same mix of half a dozen deathclaws every time. 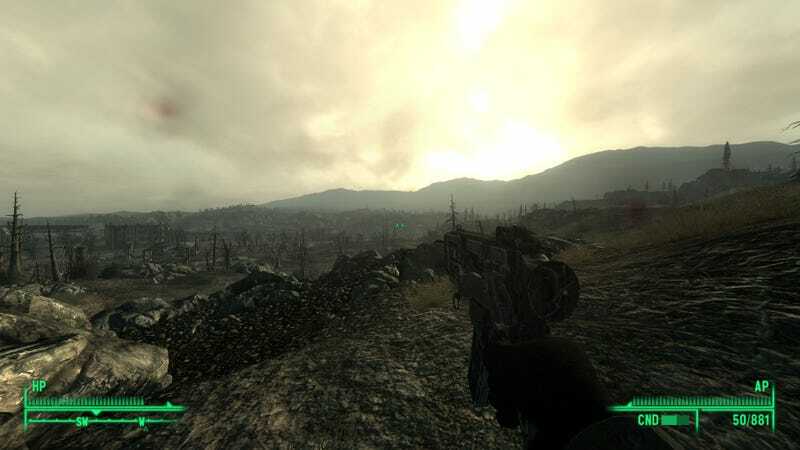 Fallout 3 populates its world in a way that feels much more natural. Yao guai, for instance, will show up the further away you get from downtown DC. Super Mutants live throughout the DC area. It makes sense that the super mutants would hole up in irradiated ruins, while the wildlife would stick to the wilds outside. New Vegas uses predictable enemy types to establish zones that only players of certain levels can enter—a more abstract approach to world design. The games may seem virtually identical, utilizing many of the same assets and running on the same engine, but they’re very different. Bethesda’s open-world games do things with AI and population that other games don’t even attempt, and the result is a world that feels more vibrant and alive. By 1980 or so, RPGs began to evolve, with two distinct schools of design. Origin’s Ultima heads towards more simulation-oriented design, and their other games, like Wing Commander, follow suit. Interplay, Black Isle, and Bioware, on the other hand, focus more on translating traditional, abstract RPG structure into video game mechanics. One developer, Looking Glass, had this crazy idea that they could combine the simulation components of the flight simulators they were making with the adventuring elements of an RPG. The result, Ultima Underworld—yes, it’s related to Ultima—ended up being one of the most influential games of all time, with games from Portal to Dead Space to Bioshock owing something to it. Ultima Underworld even had an impact on Bethesda. You can see the RPG elements in Looking Glass’ games; System Shock 2, for instance, gave players “cyber modules,” which worked like skill points, allowing players to upgrade at various stations throughout the terminals. Despite this, Looking Glass’ games often downplayed the traditional RPG elements, seeking to remove the abstractions from them, pushing simulation elements instead. Some people argue that Bethesda doesn’t make very good RPGs, especially fans of the Obsidian-developed Fallout: New Vegas, and that’s fine, because Bethesda doesn’t make RPGs. They make immersive sims. RPGs and immersive sims both focus on the same general idea that the player is free to interact in a world as they see fit. RPGs are more abstract, relying on obvious statistics and dice rolls to determine what happens and how. Immersive sims attempt to simulate all of this, keeping the abstract numbers in the background. Fallout 3 and Fallout: New Vegas appeal to very different crowds for precisely this reason. If you’re into the immersion, you’re probably going to enjoy Fallout 3’s brilliantly-designed world. If you’re an RPG fan, New Vegas is probably your thing. Fallout 3 doesn’t really break the rules, it just follows a different set. Fallout 3 is neither RPG nor open-world sandbox. It’s a game born from the immersive sim offshoot of RPGs. Fallout 3 is a great game because everything it does works towards the goal of creating a living, breathing world. What’s cooler than that?